If I may sum up how 2008 has been for me, I would describe it as a bitter-sweet year. Bitter because of the number of cross-roads I was thrust into where difficult decisions were required of me. Sweet because after making those decisions, I see myself inching closer towards God and His will for me. Last year, two major decisions stood out. The first was to call off a relationship and the other was deciding to move to another church. The first caused me to lose faith in myself; that I was not worthy to love or to be loved. I was very close in accepting and believing that I was hopeless and incapable of loving someone else. And that I didn’t deserve to be in any romantic relationship. But in His goodness and wisdom, He showed me what I was choosing to accept and believe was not true. As indicated in my previous entry, some time after that relationship ended He allowed me to cross paths with someone whom I can confidently call my ‘missing piece’. My second major decision had led me to City Harvest Church in the later part of last year in which I had briefly recounted in my past entry. In regards to this, I have to thank His godly visionary leaders and teachers of His word in A. R. Bernard and Kong Hee. Through them, God further expanded my horizon and my hunger for the things of God and His Church; the summit of my vision became a plateau towards an even higher summit. Not only has my faith being radically challenged, my identity in Him has also being renewed and further established. Moving forward, I’m now armed with a better grasp of His vision (not a church’s) and my calling towards His redemptive plans for this world. I think it is fitting to say that God was doing a lot of major ‘underground’ work in re-aligning my life and priorities with His plans in 2008. Many of those decisions that I had to confront emerged unexpectedly. In fact, they were neither part of my plans nor what I thought were God’s intended direction for me. 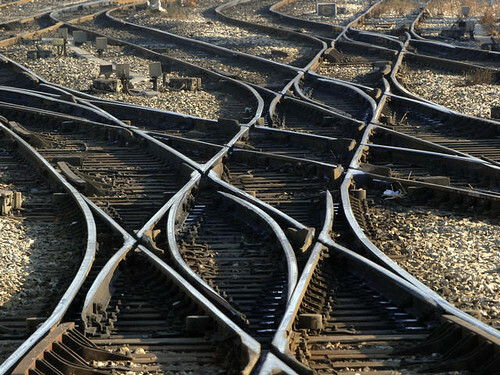 Like how a train’s destination changes course with a mere switch of lanes, I believe those decisions I had made were defining ones that will lead me to the destination He wants me to be.